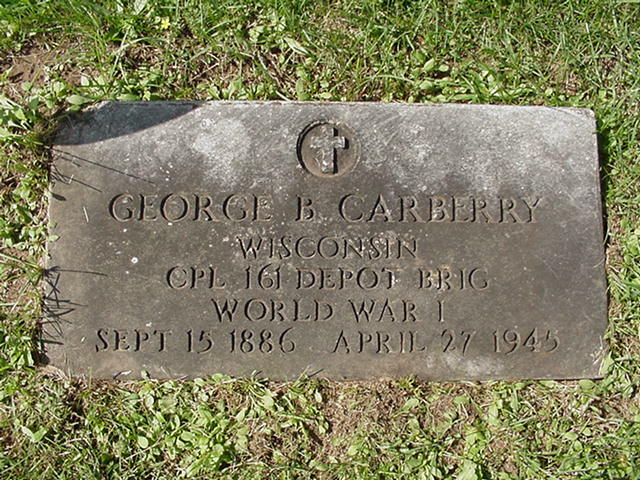 George Bernard Carberry was born September 15, 1888, in Bear Creek Twp., Sauk Co., WI, and died April 27, 1945, in the Village of Lyons, Cook Co., IL, at age 56. Buried in Saint Mary's Catholic Cemetery, Richland Center, Richland Twp., Richland Co., WI. He is the son of Joseph W. Carberry of Ireland, and Josephine Weitzel of Wisconsin. Lucille Vera Mayfield was born September 9, 1903, in Orion Twp., Richland Co., WI, and died July 19, 1961, at St. James Hospital, Blue Island, Cook Co., IL, at age 57. Buried in Cedar Park Cemetery, Blue Island, Calumet Twp., Cook Co., IL. She is the daughter of Cyrus Lorin Mayfield of Richland Co., WI, and Iva May Abbey of Aldine Twp., Norton Co., KS. George Bernard Carberry (age 34) and Lucille Vera Mayfield (age 19) were married July 24, 1923, in Cook Co., IL. Gordon Wayne Carberry: Born March 19, 1931, in Oak Park, Cook Co., IL; Died September 3, 1988, at the Veterans Administration Medical Center, Cincinnati, Hamilton Co., OH (age 57). Buried in Highland Cemetery, Fort Mitchell, Kenton Co., KY. Married (1) about 1968 in Unknown to Janice June Unknown: Born Unknown, in Unknown. Divorced November 3, 1969, in Butler Co., OH. The marriage had lasted less than one year. Married (2) October 21, 1976, in Kenton Co., KY, to Mary C. Berry: Born June 15, 1936, in Unknown. 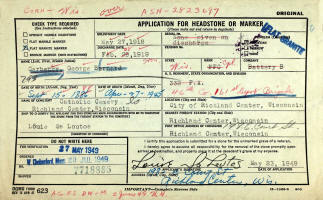 After George Bernard Carberry died, Lucille Vera (Mayfield) Carberry married Arthur H. "Art" Held. Arthur H. "Art" Held was born Unknown, and died after 1961 in Unknown, at age Unknown. Buried in Unknown. Arthur H. "Art" Held and Lucille Vera (Mayfield) Carberry were married 1954. Arthur H. "Art" Held and Lucille Vera (Mayfield) (Carberry) Held had no children. Arthur Held: Born January 5, 1908, in Chicago, Cook Co., IL; Died May, 1973, in Bellwood, Cook Co., IL. Parents are Herman C. Held and Catherine Slattery. Sister Lucille Held; Born about 1910, in Chicago, Cook Co., IL. George Bernard Carberry, as well as numerous Carberrys, are buried in Saint Mary's Catholic Cemetery, Richland Center, Richland Twp., Richland Co., WI. 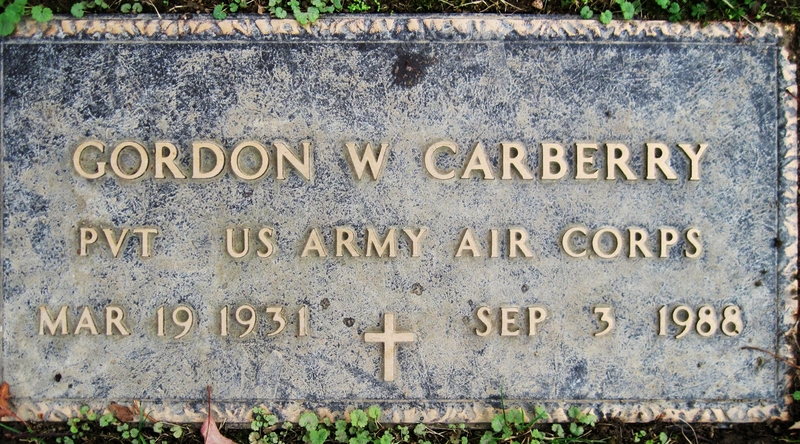 Gordon Wayne Carberry is buried in Highland Cemetery, Fort Mitchell, Kenton Co., KY. Thanks to Find-A-Grave for making this image available. 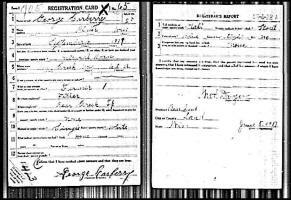 George Bernard Carberry was born September 15, 1888, in Bear Creek Twp., Sauk Co., WI. The 1895 Wisconsin State Census taken on June 20, 1895 shows Joseph Carberry is living in Buena Vista Twp., Richland Co., WI. The are 5 Males and 3 Females living there. The 1900 U. S. Census taken on June 4, 1900 shows Joseph Carberry (age 37) born December 1862 in Ireland to Irish-born parents having emigrated in 1880 and a Naturalized citizen is a Farmer renting his farm in Buena Vista Twp., Richland Co., WI. Living with him is his wife of 13 years, Josephine Carberry (age 35) born July 1864 in Wisconsin to German-born parents, with all 6 children born to her living at home, born in Wisconsin to Irish and Wisconsin-born parents: George Carberry (age 11) born September 1888; John J. Carberry (age 10) born June 1890; Carmelia Carberry (age 8) born February 1892; Jacob Carberry (age 4) born September 1895; Albert Carberry (age 3) born January 1897; and Fremont H. Carberry (age 9/12) born August 1899. Two servants also live in the home. Arthur Hugo Held was born April 18, 1913, in Chicago, Cook Co., IL. The 1905 Wisconsin State Census taken on June 1, 1905 shows Joseph Carberry (age 42) born in Ireland to Irish-born parents is a Farmer owning his own farm with a mortgage and is living in Bear Creek Twp., Sauk Co., WI. Living with him is his wife of 22 years, Josephine Carberry (age 41) born in Wisconsin to German-born parents. Also living there are his 8 unmarried children, all born in Wisconsin to Irish and Wisconsin-born parents: George Carberry (age 16); Joseph Carberry (age 15); Eula Carberry (age 12); Jacob Carberry (age 10); Bert Carberry (age 7); Francis Carberry (age 5); Raymond Carberry (age 4); and Bessie Carberry (age 2). The adjacent farm is owned by Edward Weitzel (age 38) who is directly related. The 1905 Wisconsin State Census taken on June 1, 1905 shows Cyrus L. Mayfield (age 28) born in Wisconsin to Wisconsin-born parents is a Farmer renting his farm and living in Orion Twp., Richland Co., WI. Living with him is his wife, Iva Mayfield (age 26) born in Kansas to Wisconsin-born parents. Also living there are his three children, all born in Wisconsin to Wisconsin and Kansas-born parents: Melva Mayfield (age 5); Lucile Mayfield (age 2); and son Leslie Mayfield (age 3/12). The 1910 U. S. Census taken on April 29, 1910 shows Cyrus L. Mayfield (age 32) born in Wisconsin of Wisconsin-born parents is a farmer owing his home and living in Orion Twp., Richland Co., WI. He has been married for eleven years to Iva Mayfield (age 31) born in Kansas to Canadian and Wisconsin-born parents. All five of her children were born in Wisconsin and are living at home: Melva Mayfield (age 10); Lucie Mayfield (age 6); Lesly Mayfield (age 5); Marvin Mayfield (age 2); and Thelma Mayfield (age 9/12). Elijah Mayfield and family (Cyrus' parents) live on the adjacent farm. Salome (Blake) Pugh and family also lived nearby. The 1910 U. S. Census taken on April 25, 1910 shows Joseph Carberry (age 48) born in Ireland to Irish-born parents having emigrated in 1881 and a Naturalized citizen is a Farmer owning his farm in Bear Creek Twp., Sauk Co., WI. Living with him is his wife of 22 years, Josephene Carberry (age 45) born in Wisconsin to German-born parents, with 8 children born to her living at home, born in Wisconsin to Irish and Wisconsin-born parents: George Carberry (age 21), Farming on Home Farm; Mary Carberry (age 17); Jacob Carberry (age 15); Francis Carberry (age 11); Raymond Carberry (age 9); Sylvester Carberry (age 7); Regina Carberry (age 4); and Ambrose Carberry (age 2). The adjacent farm is owned by Edward Weitzel (age 38), who is directly related. The 1910 U. S. Census taken on April 30, 1910, shows Frank P. Held (age 50) born in Illinois to Germany and New York-born parents, and in his first marriage, is a married Finisher at a Hardwood Mill, and who is renting his home, and is living at 2736 South Ridgeway Avenue, 34th Ward, City of Chicago, Cook Co., IL Living with him are: his wife of 26 years, Anna Held (age 49) born in Wisconsin to Germany-born parents, and in her first marriage, with 6 of the 8 children born to her still alive; his unmarried son, Arthur Held (age 26) born in Illinois to Illinois and Wisconsin-born parents, a Teamster at an Express Company; his unmarried daughter, Loretta Held (age 22) born in Illinois to Illinois and Wisconsin-born parents, a Twine Winder at a Mill; his unmarried son, George Held (age 20) born in Illinois to Illinois and Wisconsin-born parents, a Clerk in a Rail Road Office; his unmarried daughter, Marie Held (age 15) born in Illinois to Illinois and Wisconsin-born parents, a Packer in a Candy Factory; his daughter, Irene Held (age 3) born in Illinois to Illinois and Wisconsin-born parents; and an unmarred boarder, Sophie Gohske (age 23) born in Illinois to German and French Swiss-born parents, a Twine Winder at a Mill. 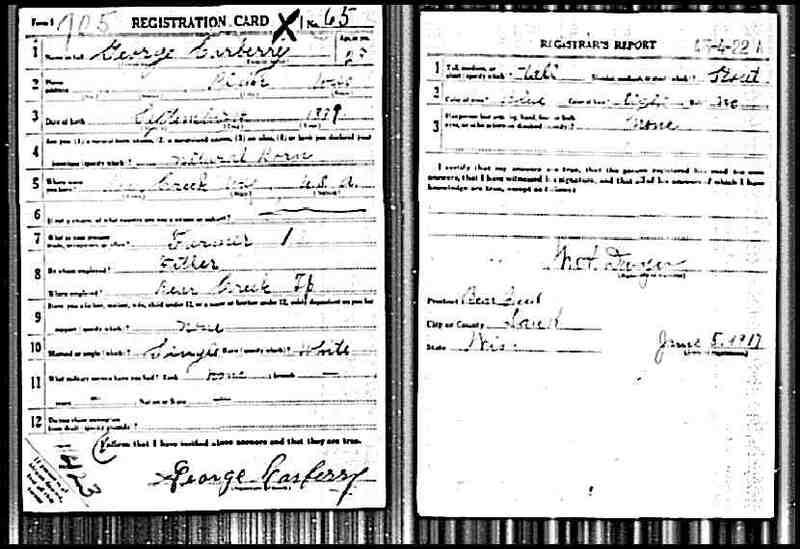 The WWI Draft Registration Report dated June 5, 1917, shows George Carberry is unmarried. The 1920 U. S. Census taken on January 8, 1920, shows Cyrus L. Mayfield (age 42) born in Wisconsin to Wisconsin-born parents, is a Farmer owning his own farm, and is living in Orion Twp., Richland Co., WI. Living with him is his wife Iva M. Mayfield (age 40) born in Kansas to Canadian and Wisconsin-born parents. Their five youngest children are also living at home, who were all born in Wisconsin: Lucile V. Mayfield (age 16); Leslie W. Mayfield (age 14); Marvin J. Mayfield (age 12); Thelma Mayfield (age 10); and Ruby E. Mayfield (age 4). The 1920 U. S. Census taken on January 22, 1920, shows Frank P. Held (age 60) born in Illinois to Germany and New York-born parents is a married Piano Finisher at a Piano Factory, and who is renting his home, and is living at 2159 La Porte Avenue, 33rd Ward, City of Chicago, Cook Co., IL Living with him are: his wife, Anna Held (age 59) born in Wisconsin to Germany-born parents; his unmarried son, Arthur A. Held (age 36) born in Illinois to Illinois and Wisconsin-born parents, a Stock Clerk at an Electric House; his unmarried daughter, Marie Held (age 25) born in Illinois to Illinois and Wisconsin-born parents, a Cashier for Retail Dry Goods; and his unmarried daughter, Irene Held (age 13) born in Illinois to Illinois and Wisconsin-born parents. The 1920 U. S. Census taken on February 12, 1920, shows Josephine Carberry (age 55) born in Wisconsin to Berlin, Germany and Holland-born parents is a widow owning her own home at 180 N. Park Street, 3rd Ward, City of Richland Center, Richland Twp., Richland Co., WI. Her unmarried children living at home, all born in Wisconsin to Irish and Wisconsin-born parents: George B. Carberry (age 31) a Tinner Apprentice; Mary L. Carberry (age 27) a Bakery Saleslady; Jacob V. Carberry (age 25) a Dray Line Laborer; Sylvester A. Carberry (age 16) a Farm Laborer; Regina J. Carberry (age 13); and Ambrose D. Carberry (age 11); and Veronica L. Carberry (age 9). The nearby home is owned by Paul Weitzel (age 43) who is directly related. 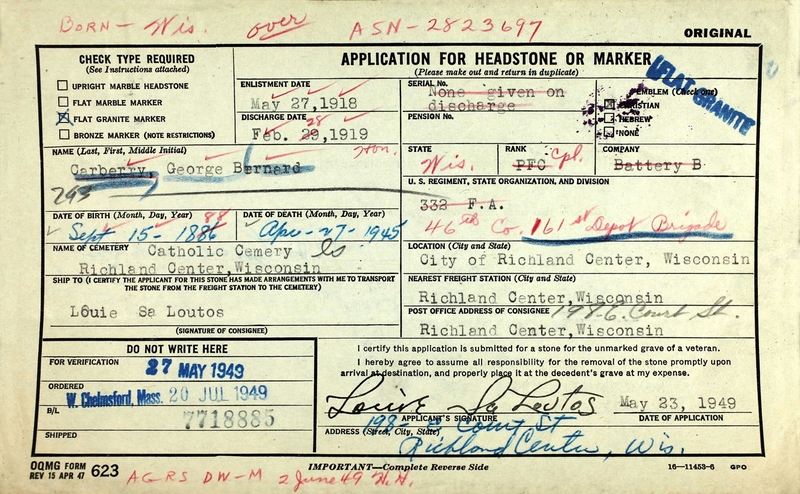 The 1930 U. S. Census taken on April 16, 1930, shows George Carverry (age 41) born in Wisconsin to Northern Ireland and Wisconsin-born parents and first married at age 34 is an Auto Truck Mechanic who is renting his home for $20/month and is living at 2338 Kostner Ave., 23rd Ward, City of Chicago, Cook Co., IL. Living with him is his wife, Lucielle Carverry (age 26) born in Wisconsin to Wisconsin-born parents and first married at age 19, a Sales Clerk. Joseph Carberry, 40, of 2400 Commonwealth ave., proprietor of the Hillington grocery store, died this morning at a Madison hospital after a short illness. 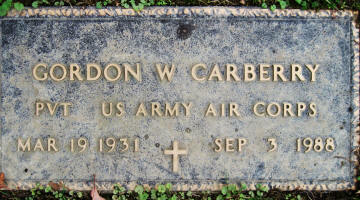 Mr. Carberry had lived in Madison for about four years, coming here from Spring Green. He was born near Bear Valley, Wis., and had also lived in Richland Center. Surviving are his widow, Mrs. Margaret Carberry, three children, Thomas, 12; Dorothy, 11; and Margaret, 7; six brothers, George, Raymond, Sylvester, Chicago; Jacob, Hartland; Ambrose, Richland Center; Francis, living in California; and three sisters, the Misses Eulalia, Regina, and Lorraine Carberry, Richland Center. Final arrangements are pending word from the brother in California. The 1940 U. S. Census taken on April 16, 1940, shows George Carverry (age 51) born in Wisconsin, and 5 years ago was living in the Same House, and with 8 years of School, is a married Foreman at a Trucking Concern who is renting his home for $32/month and is living at 4436 31st Street, 23rd Ward, City of Chicago, Cook Co., IL. Living with him are: his wife, Lucille Carverry (age 36) born in Wisconsin, and 5 years ago was living in the Same House, and with 8 years of School; and his son, Wayne Carverry (age 9) born in Illinois, and 5 years ago was living in the Same House, and with 3 years of School. 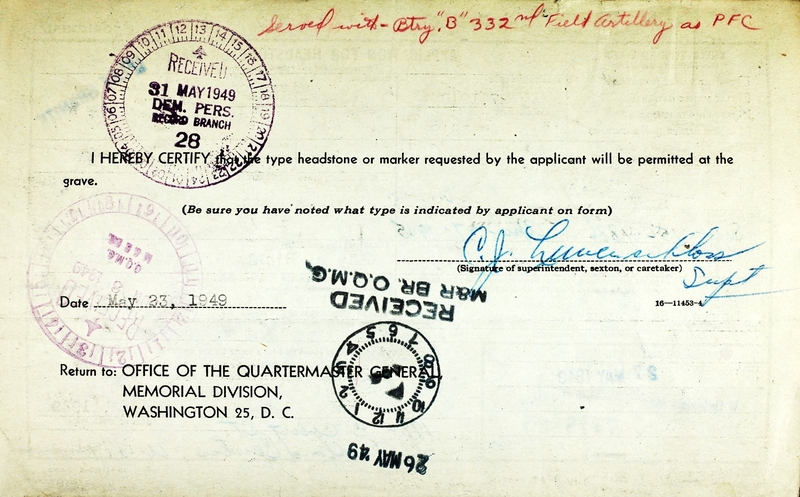 Names Presented as They Appear on U. S. Books. Following are some of the names of possessors of slot machines in Chicago and Cook county suburbs who have paid federal taxes on the machines, according to Carter H. Harrison, collector of internal revenue. The names were made public yesterday in a list of 1,900 operators in 26 northern Illinois counties who paid the federal tax. Mary Horalek, Log Cabin tavern, 7318 Pershing rd., Lyons. 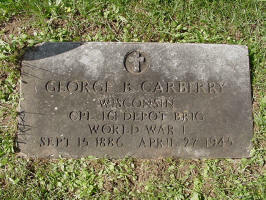 George Bernard Carberry died April 27, 1945, in the Village of Lyons, Cook Co., IL, at age 56. Buried in Saint Mary's Catholic Cemetery, Richland Center, Richland Twp., Richland Co., WI. 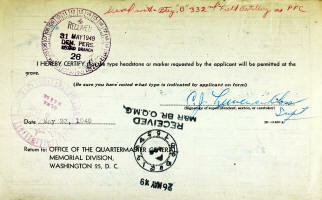 George Bernard Carberry Military Grave Marker Order. RICHLAND CENTER - Funeral services will be held at St. Mary's Catholic church at 9:30 a. m. Tuesday for George Carberry, 58, who died Friday in Lyons, Ill. The Rev. Owen Mitchell will officiate and the American Legion post will accord him military honors as a World War I veteran. Burial will be in St. Mary's cemetery. Mr. Carberry has seen service in France. Mr. Carberry, who was foreman of the Diamond T. Truck Manufacturing Co., was born in Sauk county. He worked as a plumber in Richland Center before going to Chicago some 20 years ago. He is survived by his wife, the former Lucile Mayfield of Richland county; a son Wayne; five brothers, Jake and Raymond, Richland Center, Sylvester, Chicago, Francis, California, and Ambrose, Adams, and three sisters, Lulu and Mrs. Albert Ebert, Richland Center, and Mrs. Lloyd Van Slyke, Lone Rock. Prin. Ambrose Carberry was called to Richland Center, Friday, by the death of his brother, George Carberry, at Chicago. Funeral services were conducted at St. Mary's Catholic church at Richland Center Tuesday morning. Mrs. Marvin Bredeson substituted teaching in the eighth grade while he was away. In raids in Lyons police arrested the following: Lucille Carberry at 7318 W. 39th st., Evelyn Johnson, Charles Rimek, and Hyman Frank at 7236 W. 39th st., Marion Olszewski at 7325 W. 39th st., Henry Burns at 8142 Salisbury av., Frank Hotalek at 7339 W. 39th st., Emil Anderson at 8526 Odgen av., and Vincent Diskin and Margaret Graham, both at 8039 Ogden av. All were charged with being keepers of a gambling house. Log Cabin, Lucille Carberry, proprietor, 7318 Pershing rd., Lyons. Lucille Carberry, 7318 Pershing rd., Lyons. Arthur Held and Lucille Vera (Mayfield) Carberry were married about 1954. Have sold tavern known as Art and Lu's Hopalong Inn. Responsible for our debts only. Arthur H. Held and Lucille Held, 2838 W. 63d-st.
Lucille Vera (Mayfield) (Carberry) Held died July 19, 1961, in St. James Hospital, Blue Island, Calumet Twp., Cook Co., IL, at age 57. Buried in Cedar Park Cemetery, 12540 S. Halsted Street, Blue Island, Calumet Twp., Cook Co., IL. Lucille V. Held, late of Oak Forest, Ill., beloved wife of Arthur; fond mother of Gordon; daughter of Ivy Mayfield and the late Cyrus. Funeral Saturday, 11 a. m., at Hickey Chapel, 4201 W. 147th street, Midlothian. Interment Cedar Park, FU 5-4478.